James Morrissey, of Wild Coyote Studio, recounts his favorite photos from 2014. I am a frenetic man. I have a remarkable amount of energy and finding ways to channel it in a constructive way has been a life long endeavor. Photography, for me, has been one of the key tools I have used to make me a more deliberate person. Photography is more than just a passion. It is one of the things that makes me 'me.' It has become a tool that I use to see the world. The times that I most remember, the times I feel most alive, are typically those where I have my camera and tripod with me. Given that, you would think I would be a bit better at it. :P With that aside, as I write this retrospective of my year, I hope that you sense that love and deliberateness. Of the photos I picked for my 'favorite' shots of 2014, two of them were taken within a few miles of my apartment. The first of the two photos was taken literally just down the street in Inwood Hill Park. The bridge in this photo is the Hudson Bridge, which links Manhattan and the Bronx. Besides being a rare sunset, we were fortunate that the salt marsh (the only natural salt marsh left in Manhattan) was full. Often this area is just a pool of mud. The cloud cover was able to refract the light and bend it over the pool, giving an amazing sunset that was reflected from below. In over 10 years of photographing this marsh, I have never had a better sunset in this area. Inwood, Upper Manhattan - Sunset. Canon EOS 5d3, 24mm Tilt Shift, Using a Singh Ray 2 Stop Hard Filter. The next photograph is of a natural occurrence where the sun set aligns with the New York City street grid. It is an event called "Manhattanhenge." It occurs on two occasions every year - typically in late May and again in Mid-July. Photographing Manhattanhenge is a real hoot. This year, for example, there must have been two hundred people running across the street at the red light, blocking traffic and making a commotion while standing in the middle of the street in order to get a good view. For much of the event, I feared that we were not going to see the famed effect. When the sun finally dropped, it occurred incredibly fast. The sun, rotated from behind a building and into the middle of the street grid. It was intense. The sky was red, the cars were honking their horns and the people were all cheering. It was wild. It was alive. It was New York. 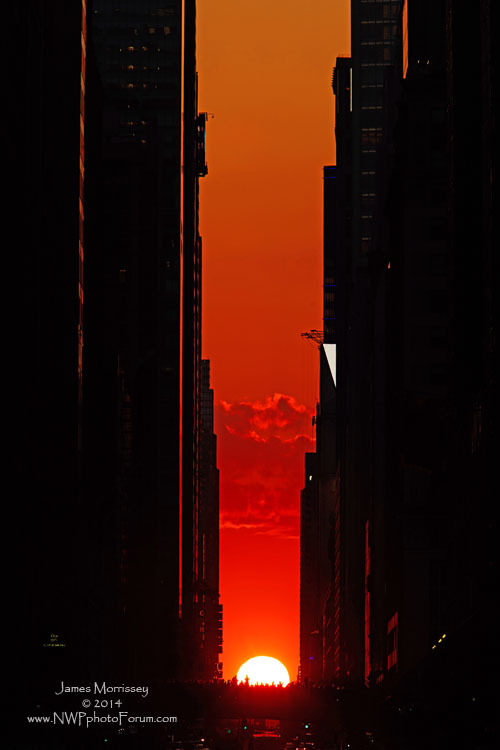 Manhattanhenge - 42nd Street - Sunset. Canon EOS 5d3, 70-200 F2.8L w 1.4x Tele. The next two photographs occurred a little bit father from home - but they were both within driving distance of my apartment. This first photograph was taken on our trip to Acadia National Park this summer, in Maine. 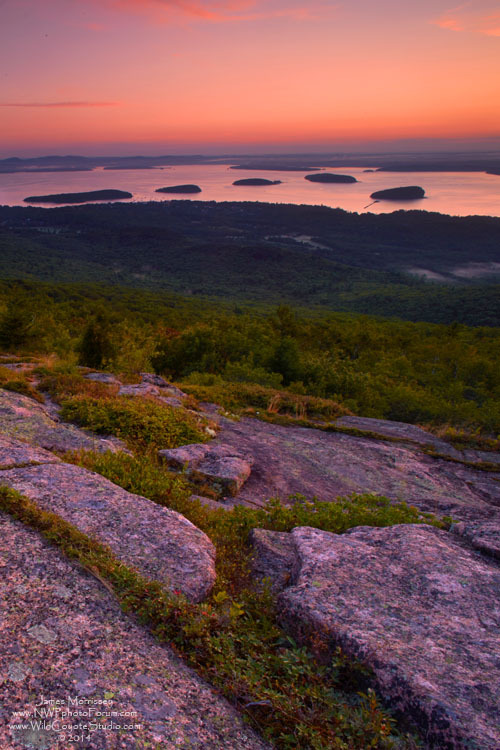 It was my first ever 'good' sunrise at Cadillac Mountain. In five years of going back and forth to Acadia, most of what I have gotten at sunrise is fog. I was on top of Cadillac Mountain facing North. We had stopped about 2/3 of the way up the mountain on a lark. I had a feeling that we might get a good sun rise and the location yielded a nice sloping foreground to put into the composition. The belt of islands in the top of the frame are referred to as the Porcupine Islands, located in Frenchman's Bay. The side light that came from the East was quite pleasing, lighting the foreground rock and the Porcupine Islands, while leaving much of the middle frame still in shadow. I printed this image at 24x36 and placed it in my kitchen. I also have a copy in my office. This next photo was taken while I was on holiday this Christmas in Newport, Rhode Island. While I grew up in Rhode Island, I have only been to Newport a handful of times. Newport is 'big money' and I would not normally play there, outside of going to the museums. 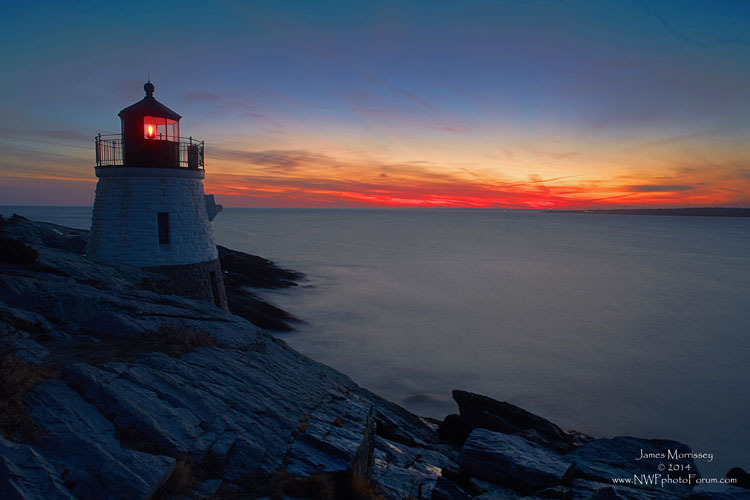 I was flipping around websites looking for Rhode Island photographic locations and I came across this view of Castle Hill Lighthouse, located near Hammersmith Farm. Hammersmith Farm is famous for being the childhood home of Jacqueline Kennedy Onassis. I was enthralled and have been planning this trip for months. As we were on holiday, this became a bit of a family affair. Both of my parents, and my sister and her husband and her kids came with Chanthee and me on this excursion. We left the house late, and I flew like the wind to Newport from Cranston, Rhode Island. We got out there a few minutes past peak - but, I still love this photo. To create some drama in the ocean, to help make up for the fading light in the sky, I dropped the ISO of the 5d Mark III to 50 and dragged the shutter for several seconds so that I could turn the ocean into the cotton candy like texture. I also used two Singh Ray filters, stacked, to help brighten the foreground. I proofed the image at 12x18, and it is sharp with plenty of detail in the shadow areas. The last two images of my year end review were from my trip with Steve Kossack to the Yosemite High Camps this year. It was the big trip of the year for me. It was also an adventure that I will never forget. I wrote extensively on hiking the Yosemite here. It was hard to pick which photos from the trip I wanted to show off. Honestly, there were several other images that I took that I thought were just as fine. 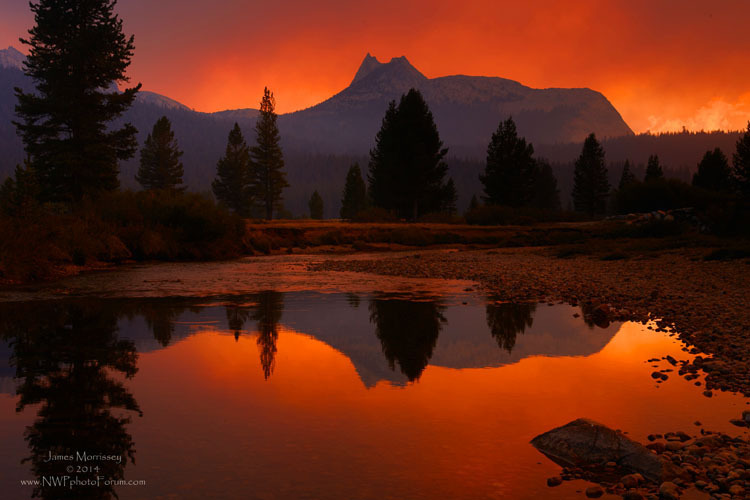 The image below was taken from Tuolumne Meadows of Cathedral Peak. Tuolumne Meadows is one of my favorite photographic locations that I have had the opportunity to visit. Before someone asks - yes, the colors are real. I don't play much with my work in Photoshop, preferring to try to get the images as right as possible in camera. There was a large fire that was creating the most intense sunset with syrupy colors. Sunset - Cathedral Peak, Canon EOS 5d Mark III, 28-70 F2.8L at 50mm, with Singh Ray 2 Stop Hard Filter. This last image was taken at Glen Aulin. 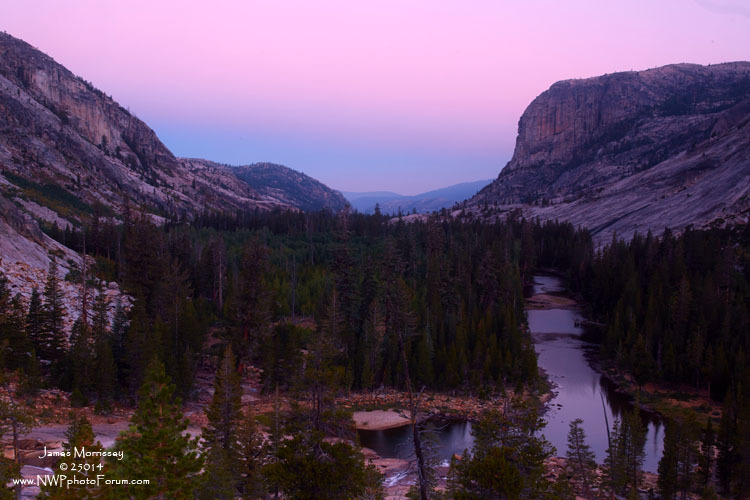 Glen Aulin is the closest high camp from Tuolumne Meadows. This photo was taken not more than 100 yards from the camp ground on our first night. At the time I took the photo, I was disappointed with the sky, hoping for the bold reds that I got in Tuolumne Meadows, just a few miles away. However, when I opened the image in Capture One, I was blown away by the subtle purples that framed the landscape. Sunrise at Glen Aulin, Canon EOS 5d Mark III, 28-70 F2.8L at 40mm with Singh Ray 2 Stop Hard Filter. Well, there you have it. These are the nature photographs that I look back at as my favorite for 2014. Every time I go out with a camera, whether it be here in New York City, or in the Yosemite back country, or somewhere in between, I realize that I am the most fortunate man in the world. I am incredibly thankful for all of the gifts that I have. Thank you for taking this trip through 2014 with me. Just a friendly reminder that the photos and article are copyright 2014/2015 James Morrissey, and the Nature, Wildlife and Pet Photography Forum.